High levels of triglycerides can increase the risk of obesity, heart disease, and diabetes, among other diseases. However, low triglyceride levels can also be harmful to the body. Read on to learn more about the causes of high and low triglyceride levels, associated diseases, and how to manage high or low levels. Triglycerides are the main type of fat (lipid) found in the human body. They are made up of 1 molecule of glycerol and 3 molecules of fatty acids. Triglycerides are derived from the food consumed in the diet or produced in the liver [R]. Since triglycerides cannot travel through blood (they are insoluble in the blood), they are transferred inside particles known as chylomicrons (special lipoproteins that transfer triglycerides and cholesterol from the gut to other parts of the body) [R]. When a person is not eating for a prolonged period, fatty acids are released from the body fat tissue (storage site of triglycerides) and returned to the liver. 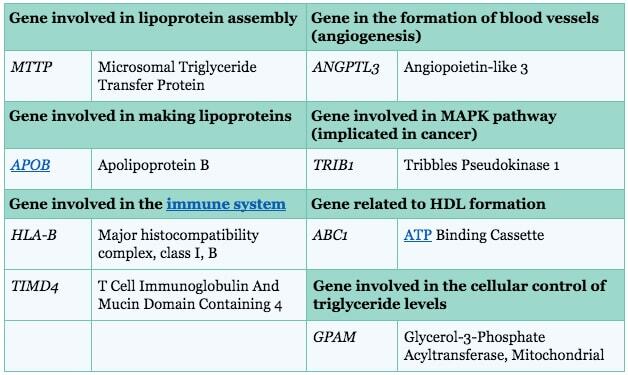 The liver transforms these fatty acids into triglycerides, which are then packaged in very-low-density lipoproteins (VLDL) and secreted into the blood [R]. Triglycerides can be used as a form of energy. A special enzyme (lipoprotein lipase) that is present on the blood vessels lining muscles and fat tissue breaks down chylomicrons and VLDL into free fatty acids. Free fatty acids are used as an energy source by muscles [R]. A blood test can measure blood levels of triglycerides. The blood test is done after an overnight fast for accurate triglyceride measurement. Blood triglyceride levels may vary on a daily basis and tend to be higher 1 to 4 hours after meals [R]. In 5,610 US adults, the prevalence of hypertriglyceridemia was 33.1% from 1999 to 2004, whereas the prevalence of severe hypertriglyceridemia (500 to 2,000 mg/dl) was 1.7% in 5,680 adults from 2001 through 2006 [R, R]. High triglyceride levels can be caused by genetic or hereditary factors (primary hypertriglyceridemia), environmental factors, or other diseases (secondary hypertriglyceridemia) such as diabetes, heart disease, and cancer [R]. In 3,474 non-diabetic adults, increased blood triglyceride levels were associated with 39 genetic variants over the course of a 5-year follow-up period [R]. In a 9-year study on 9,328 Europeans, people with higher triglyceride gene scores had a greater increase in their triglyceride levels compared to those with lower triglyceride gene scores [R]. Men of African origin had lower triglycerides than white men. Additionally, Afro-Caribbean men had significantly lower triglyceride levels compared to either African-American or white men [R]. In 285 overweight adults, women and black participants had lower levels of triglycerides compared to men and white participants [R]. In 5,708 adults, non-Hispanic whites had higher triglyceride levels than non-Hispanic blacks and Mexican-Americans [R]. Chylomicronemia syndrome is a disorder in which the body does not break down fats correctly. This causes a buildup of blood triglycerides. It occurs due to a deficiency of lipoprotein lipase or apolipoprotein C-II; or, an inhibition of lipoprotein lipase [R, R]. Personality traits may play a role in the triglyceride levels. In 5,532 Italians, the ones more impulsive and open to experience had higher triglyceride levels [R]. High levels of blood triglycerides cause leptin and insulin receptor resistance at the blood-brain barrier, which leads to obesity [R, R]. 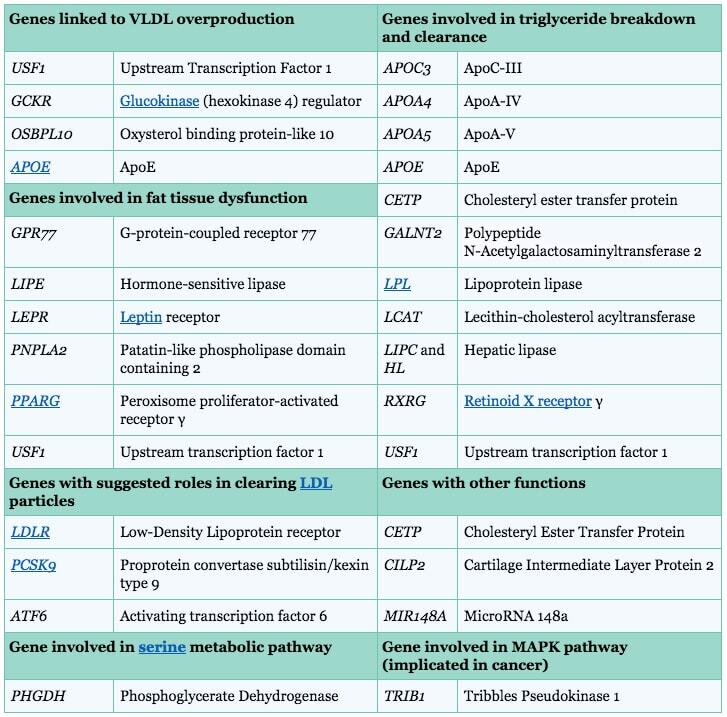 Overproduction of Very-Low-Density Lipoprotein (VLDL, containing triglycerides produced in the liver) and delayed removal of chylomicrons (containing triglycerides derived from food) caused increased triglyceride accumulation. This leads to an excess release of fatty acids and to obesity [R, R, R,]. In a meta-analysis of 9,664 Swedish adults, body fat increased the influence of the triglyceride-increasing gene variants, especially in women [R]. In 8,526 Danish adults, obese subjects had higher triglyceride levels due to triglyceride-increasing genes, when compared to leaner subjects [R]. Blood triglycerides were higher in 45 obese non-diabetics compared to 78 lean subjects [R]. A case-control study of 569 obese and 194 healthy Chinese children and adolescents revealed that genetic variations in the APOA5 gene (rs662799 and rs651821) may dictate how susceptible an individual is in developing obesity [R]. In 54 patients undergoing kidney removal, surgical specimens from the kidney showed that high blood triglycerides were found in people with an increased BMI, which was used as a marker for obesity [R]. Atherogenic dyslipidemia refers to increased levels of triglycerides, Low-Density Lipoprotein (LDL), and decreased HDL cholesterol levels. This increases the risk of heart disease, particularly heart attack and narrowing blood vessels due to fat buildup (atherosclerosis) [R, R]. Yet, high blood triglycerides increase the risk of heart disease, even when cholesterol levels are within the normal range [R]. Insulin is a hormone that signals cells to absorb glucose in the liver, muscles, and fat tissue. Insulin also triggers the activity of lipase lipoprotein [R, R]. Insulin resistance results in decreased activity of lipoprotein lipase, leading to increased triglyceride levels [R, R, R]. Increased blood triglycerides also cause insulin resistance [R]. High blood triglycerides increased the risk of type 2 diabetes, independent of other risk factors (obesity, eating habits, smoking, cholesterol, diabetes, and blood pressure) in a 10-year study on 13,953 healthy men [R]. An increase of blood triglyceride by 10 mg/dL increased the risk of type 2 diabetes by 4% in a 12-year study on 5,085 healthy adults [R]. In a study (RCT) of 773 pregnancy-induced diabetic women, blood triglyceride levels were higher in women treated with metformin (type 2 diabetes drug) compared to women treated with insulin [R]. Blood triglycerides were higher in 19 type 2 diabetics compared to 78 lean subjects [R]. Triglyceride levels that are elevated due to specific genetic variants (rs2954029, rs714052, rs7557067, rs17216525,rs10889353, rs7679, rs7819412, rs328, rs3135506, rs662799) are not associated with a higher risk of type 2 diabetes, increased glucose, and/or insulin [R]. NAFLD is a clinical condition caused by a buildup of triglycerides in the liver in the absence of excessive alcohol consumption, which is also associated with obesity and insulin resistance [R]. The excessive buildup is a result of increased triglyceride production due to a high-fat diet or insulin resistance, insufficient removal of triglycerides due to faulty fatty acid breakdown, or defective VLDL production [R, R, R, R, R]. In 293 patients with and without NAFLD, high blood triglycerides were predictive of developing NAFLD [R]. In 156,153 adults, high blood triglycerides increased the risk of lung, rectal, and thyroid cancer, but lowered the risk of non-Hodgkin’s lymphoma (cancer of the lymphocytes, a type of white blood cell) [R]. In 84,460 women and 71,693 men, high triglyceride levels increased the risk of cervical, ovarian, and endometrial cancer, and decreased the risk of prostate cancer respectively [R]. In 257,585 men, high blood triglyceride increased the risk of cancer overall and cancer of the colon, lungs, kidney, skin, and thyroid, but lowered the risk for non-Hodgkin’s lymphoma and prostate cancer [R]. In 256,512 women, high blood triglycerides increased the risk of cancer overall and cancer of the lungs, cervix, and skin [R]. For breast cancer, some studies report a positive association between high blood triglycerides and breast cancer risk, whereas one showed an inverse association [R, R, R, R]. For prostate cancer, studies show either a positive, inverse or no association between high triglyceride levels and prostate cancer risk [R, R, R, R]. In a meta-analysis of 619,410 subjects and 15,691 prostate cancer patients, and 590,878 subjects and 12,177 breast cancer patients, increased triglyceride levels were not associated with the risk of prostate or breast cancer [R]. Lower blood triglyceride levels were found in 135 lung cancer patients compared to 39 healthy adults [R]. In 25,641 patients with late-stage chronic kidney disease, blood triglyceride levels equal to or more than 200 mg/dL increased the risk of death among patients younger than 65 [R]. Increased blood triglycerides were associated with epidemic nephropathy (a viral disease) in 228 patients. High blood triglyceride levels were also associated with high blood VEGF levels [R]. Farnesoid X receptor (FXR) is vital for bile acids and fat balance. It also controls the production of triglycerides in the liver. Out of 67 patients with bile acid diarrhea, 25 had raised triglyceride levels (more than 1.9 mmol/L) [R]. Blood triglycerides above 1,000 mg/dL (chylomicronemia) can cause acute pancreatitis [R, R, R, R]. High blood triglyceride levels may also cause chronic pancreatitis [R, R]. High blood triglycerides also increased hospital stay, intensive care unit (ICU) admissions, and ICU stay duration [R]. In a study (DB-RCT) of 300 adults, people who consumed krill oil for 12 weeks had reduced blood triglycerides compared to the placebo group [R]. Compared to the carbohydrate diet, a protein-rich diet and an unsaturated fat diet reduced triglycerides by 15.7 and 9.6 mg/dL respectively in a study (RCT) on 164 patients with high blood pressure [R]. A monounsaturated fat diet decreased triglyceride levels, compared to a carbohydrate diet in a 7-week study (RCT) on 85 adults with an increased risk of heart disease [R]. A diet rich in omega-3 fatty acids (polyunsaturated fatty acid, PUFA diet) decreased triglycerides compared to a diet rich in saturated fatty acids (SFA) in a study (RCT) on 67 obese adults [R]. A meta-analysis showed that 4-week vitamin C supplementation reduced blood triglycerides in 460 subjects [R]. An olive-oil-rich diet decreased the accumulation of triglycerides in the liver [R]. In 12 healthy subjects, taking fish oil supplements lowered blood triglyceride levels by 48% [R]. Consumption of fenugreek seeds lowered blood triglyceride levels in patients with type 1 and type 2 diabetes [R, R]. A high-fat diet decreased triglyceride levels in 17 moderate hypertriglyceridemic men [R]. Phytic acid consumption reduced triglycerides in diabetic rats [R]. Guggul decreased blood triglycerides in hyperlipidemic (very high-fat levels) rabbits [R]. Ashwagandha (Withania somnifera) consumption decreased blood triglyceride in rats with high cholesterol [R]. Reducing sugar-sweetened drinks can lower blood triglycerides. Substituting water for sugar-sweetened drinks reduced triglyceride levels in a study on 240 obese Mexican women [R]. Niacin inhibits DGAT2, a key enzyme in triglyceride production in the liver. This causes a reduction in triglycerides and VLDL release [R]. In a meta-analysis (4,749 subjects), niacin reduced blood triglycerides by 20% [R]. In another meta-analysis (432 patients with abnormal fat levels), niacin decreased the blood levels of triglycerides, and the effect was higher among women [R]. In a study (DB-RCT) of 942 patients with abnormal fat levels, adding niacin to an ezetimibe/simvastatin treatment for 64 weeks decreased blood triglycerides [R]. Niacin decreased triglyceride levels and other fats in 223 adults with high cholesterol [R]. Niacin in combination with statin therapy decreased blood triglycerides in a 3-year study (RCT) on 3,414 heart disease patients [R]. In a 16-week study (DB-RCT) on 60 metabolic syndrome patients, niacin reduced blood triglycerides by 30% compared to the placebo group. Niacin with omega-3 fatty acids decreased triglycerides by 42% compared to the placebo group [R]. In a 24-week study (DB-RCT) on 191 HIV+ patients, the combination of niacin and fenofibrate reduced triglycerides by 52%, compared to the usual treatment [R]. Niacin, gemfibrozil, and insulin decreased the blood triglycerides of a 53-year old diabetic, obese, and hypertriglyceridemic man [R]. Fibrates trigger lipoprotein lipase activity and inhibit triglyceride production in the liver [R]. In a meta-analysis (16,802 subjects), fibrates lowered blood triglycerides by 36% [R]. Gemfibrozil decreased triglycerides by 31% compared to the placebo group, in 2,531 men with coronary heart disease (DB-RCT) [R]. In a study (DB-RCT) of 3,090 heart patients, bezafibrate was safe and effective in decreasing triglycerides by 21% compared to placebo [R]. A combination of niacin and fenofibrate effectively reduced triglycerides by 52% in 191 HIV+ patients, compared to the usual care [R]. Gemfibrozil was more effective than simvastatin in lowering triglycerides in a study (DB-RCT) of 96 type 2 diabetics [R]. In a case study of a 53-year old diabetic, obese man with abnormal fat levels, gemfibrozil together with niacin and insulin reduced his blood triglyceride levels [R]. Pharmaceutical omega-3 fatty acids can decrease blood triglyceride levels [R]. In 60 patients with metabolic syndrome (DB-RCT), a 16-week omega-3 fatty acid supplementation decreased blood triglycerides by 22% compared to the placebo group. Omega-3 fatty acids together with niacin were even more effective, reducing blood triglycerides by 42% compared to the placebo group [R]. In 82 patients with a fat disorder (lipodystrophy), metreleptin (a synthetic version of leptin) significantly reduced blood triglycerides [R]. Statins, ezetimibe, PCSK9 inhibitors, lomitapide, and mipomersen are drugs used to lower cholesterol, but they also reduce blood triglyceride levels [R]. SR9009, a stenabolic, reduced blood levels of triglycerides in obese mice and mice on a high-cholesterol diet [R, R]. Galactooligosaccharides (a type of prebiotic) mixture lowered triglycerides in 45 overweight adults in a study (DB-RCT) [R]. A 6-week consumption of a Lactobacillus Salivarius probiotic and a fructooligosaccharide (FOS) prebiotic significantly reduced blood triglycerides in 45 healthy young adults in a pilot study (SB-RCT) [R]. However, a Lactobacillus fermentum probiotic did not alter triglyceride levels in a study (DB-RCT) of 46 adults with high cholesterol [R]. In a study (DB-RCT) of 32 adults with high cholesterol, a synbiotic product (a mixture of prebiotic and probiotic) containing L. gasseri and inulin decreased total blood triglyceride levels in the treatment group compared to placebo [R]. Vanilla ice cream containing inulin lowered blood triglycerides levels by 40 mg/dL in a study (DB-RCT) of 12 men with high cholesterol [R]. Milk containing probiotic bacteria Bifidobacterium longum decreased blood triglycerides in rats fed a cholesterol diet. However, Bifidobacterium yogurt consumption in 32 adults with high cholesterol levels did not change their triglyceride levels [R]. Dietary fructans (oligofructose) reduced blood triglycerides in healthy and obese rats [R, R, R]. Aerobic exercise before a high-fat meal reduced blood triglycerides in 38 overweight adolescents, 15 metabolic syndrome patients, and in 9 obese men [R, R, R]. Exercise lowered blood triglycerides in 19 trained and untrained men [R]. A single brisk walking session decreased blood triglycerides by 30% in 11 healthy women [R]. Blood triglycerides were lower in diabetic rats who exercised compared to healthy rats with normal glucose tolerance [R]. Thirty minutes of aerobic exercise can lower triglyceride levels [R]. Insulin infusion decreased blood triglycerides by 22% in 7 healthy men [R]. Insulin injection decreased blood triglycerides in case studies of pancreatitis caused by high triglyceride levels [R, R]. In a 53-year old obese and diabetic man, injection of insulin (along with niacin and gemfibrozil) reduced his increased blood triglycerides [R]. Low blood triglycerides can also be harmful, as they are associated with heart and autoimmune diseases [R, R, R]. Genetic variations in the LPL gene (rs1801177, rs118204057, rs268, rs301, rs326, rs10096633), responsible for low blood triglycerides were associated with decreased risk of all-cause death and lower risk for heart disease [R, R]. Mutations in the ANGPTL4 gene (E40K and T266M) and the APOC3 gene were associated with lower blood triglyceride levels [R, R, R, R, R, R]. In 595 healthy Taiwanese subjects, people with the APOE genetic variant (rs429358-TT) had significantly lower blood triglycerides [R]. In 80,111 Icelanders, a variant of the ASGR1 gene (del12 in intron 4) was associated with low blood triglycerides [R]. A genetic variation in the LPL gene (-93T/G) was associated with lower triglyceride blood levels in 124 pregnant African-American women, and 66 Hispanic and 42 African-American adults [R, R]. Compared to 10 obese whites, 15 obese Pima Indians had a reduced rate of Very-Low-Density Lipoprotein (VLDL)-containing triglyceride production and increased rate of triglyceride breakdown. This means that Pima Indians made fewer triglycerides and broke them down faster than the white subjects [R]. In 1,002 heart disease patients, metabolically healthy subjects had lower triglyceride levels compared to subjects with an abnormal metabolic profile, regardless of their body fat [R]. Personality traits may play a role in triglyceride levels, based on a study of 5,532 Italian adults who completed a personality test. People who were more self-disciplined, careful, and deliberate had lower triglyceride levels [R]. Lower blood triglyceride levels were found in Parkinson’s patients, in a retrospective study of 520 adults with and without brain disorders. This may explain the reduced incidence of stroke in Parkinson’s patients [R]. In 2 studies of 1,310 and 863 stroke patients, low blood triglycerides were associated with an increased risk of death and severity of stroke [R, R]. Low blood triglyceride levels were predictive of death from heart failure in 637 women [R]. Low blood triglyceride levels also increased the risk of in-hospital death and side effects in 247 heart attack patients [R]. Low levels of blood triglycerides were associated with scarring of lung tissue (pulmonary fibrosis) in 44 patients [R]. When blood triglycerides are lower than 100 mg/dL, low-density lipoprotein (LDL) cholesterol levels are highly overestimated [R, R]. A low-fat, high-carbohydrate diet increased blood triglycerides in healthy adults [R, R, R, R]. Low-fat, high-carbohydrate, sugar-rich diets increase the production of Very-Low-Density Lipoprotein (VLDL), and blood triglycerides [R, R, R]. Lack of exercise and sugar consumption, including fructose and glucose, can increase blood triglyceride levels [R, R, R].